Any nation requires all its assets to best ensure its ability to promote the general welfare of the entire nation. Every citizen has an equal stake in the entire territory of the whole nation. Foreign nations cannot lawfully steal territory by implanting a dense fifth column of their ethnicity in another nation, then invade that territory, then call upon their fifth column to support the invasion by voting for a sham "secession" which denies the rights of all citizens of the target nation to preserve their national boundaries. Demographics regarding territory are national and no district has the right to stack the deck ethnically in order to takeover territory from the nation and hand it over to a foreign enemy, most especially one that has already invaded the nation and is preventing democratic and governmental procedures. Putin is preventing Ukrainians from free travel to propagandize against the Russian annexation in Crimea. Putin is concurrently propagandizing heavily within the Crimea on Ukrainian soil that he has militarily invaded, that his Russian takeover will literally drive out the "Nazis" from the Crimea, and has brainwashed the Crimeans to falsely believe that he is waging a WW II battle against Nazi Germany, by placing billboards with swastikas in juxtaposition to Russian flags. There is no free marketplace of ideas in Crimea. Instead, there are invasive Russian troops who have besieged the Crimea and driven out the Ukrainian military, closed the borders, and intimidated, brainwashed and propagandized the population. 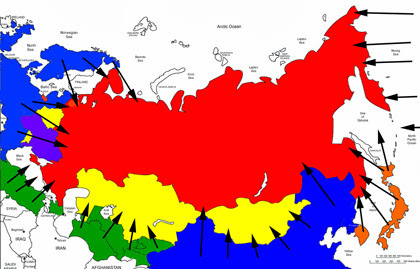 In any call for a change of national borders, it is for the nation of the Ukraine to decide whether or not it wishes to give away any territory, not for Russia to move in and steal it, and then brainwash a small portion of the population within the invaded lands to submit to the aggressor. A legal process would be for the entire nation of the Ukraine to vote on the issue, if the central government ever put the issue up for a vote, which it has not. Travel in the nation should be free and millions of loyal Ukrainians ought to have the right to live in Crimea and vote as they choose in free elections, where all sides share equal access to the public mind. Putin is a foreign aggressor who is deliberately and criminally preventing this democratic process and he is illegally violating the national sovereignty of the Ukraine. The traitorous ethnic Russians who have been brainwashed to support Putin's Russian aggression are not seceding. They are treasonously supporting an enemy Russian invasion of the Ukraine and abiding Putin's calculated theft of Ukrainian territory. The libertarians who support Putin's communist "collectivist" aggression show that they are themselves collectivist communists. Russia has no historic claim to the Crimea. Russians drove out the native population and moved in Russians, thereby committing a form of genocide. The present legal status of the Crimea is that it is Ukrainian territory owned by every citizen of the Ukraine, not a disloyal and traitorous ethnic Russian minority of Putin's awakened fifth column. It is for the nation of the Ukraine to decide whether or not it wishes to give away any territory, not for Russia to move in and steal it, and then brainwash a small portion of the population to submit to the aggressor. A legal process would be for the entire Ukraine to vote on the issue if the central government put the issue up for a vote, which it has not. Travel in the nation should be free and millions of loyal Ukrainians ought to have the right to live in Crimea and vote as they choose in free elections where all sides share equal access to the public mind. Putin is a foreign aggressor who is deliberately and criminally preventing this. Putin is stealing the Crimea from the Ukraine. There is no "secession". KGB Putin is working with the Golden Dawn in Greece and the Ergenekon in Turkey in an attempt to takeover the Black Sea. KGB Putin is hedging his bets and pitting the Greeks against the Turks and the Turks against the Greeks in hopes of agitating a bolshevik revolution in either, or both, nations. His principle assets in Greece are the Golden Dawn, who want to eliminate private property and annex parts of Turkey; and in Turkey the Ergenekon Doehnmeh crypto-jews. Should Putin succeed in bringing either group of anti-Western subversives to power, he will then attempt to secure the Black Sea for his Soviet Empire, coming and going. One way to checkmate Putin would be to close off the Black Sea to Russia in the Bosphorus in Turkey, until such time as Putin withdraws all troops from the Crimea and recognizes and honors the Ukraine's sovereignty. This would bring in both NATO nations Turkey and Greece in a common alliance against Russia, and scuttle Putin's hopes of turning these nations against America and Europe in the Bosphorus. If Putin cries foul and war begins, he will lose all the pipelines to Europe and the issue of Russian energy will become a moot point. This will render Putin's aggression in the Ukraine a complete failure and make all of his apparent gains, total losses. It will generate a surge of Turkish and Greek nationalism against the Russians, just as the Russians are trying to force the Greeks and Turks against NATO. KGB Putin's bolshevik guru and the architect of their ongoing and relentless war on America and Europe is the outspoken anti-Western bolshevik Alexandr Dugin. Dugin wants to create a common cause among nations to destroy America and Europe based not on that to which each aspires, but rather upon that which each hates, and Dugin wants to gin up the hate and the common cause by constantly villifying America and Europe, while agitating willingly traitorous domestic discontents to side with Russia against their own nations in a unilateral suicide pact with the KGB devil. Dugin wants to destroy America and Europe, so he and Putin must spread and manufacture hatred of America and Europe in order to grow their international bolshevik base. Putin has been waging this war on the United States for years. His television network is a prime example of his psychological battle in his active war against us. The libertarians and objectivists have unmasked their communism and constantly bash America and Europe for the benefit of their bolshevik master and comic book hero KGB Putin. For years, I have been warning you that the communists sent Ayn Rand to America to subvert us in the name of fighting communism. There can no longer be any doubt that the libertarians and objectivists are led by communists who want a bolshevik revolution in America and across Europe. Ron Paul has shown his true bolshevik red colors in his latest stab in the back to America, by attacking us and lauding Putin, who is out to destroy us. Paul is the ideological protégé of communist Trust agent and rabid zionist jew Ayn Rand (Alisa Zinov'yevna Rosenbaum). I have long pegged him for a communist agent and he has proven me correct. The war is raging but only the communists are fighting it, because they have Obama and Merkel working against us, and they have brainwashed our dissidents and disaffected youth to commit suicide and attack us for the benefit of the communists. The worst anti-American vitriol is coming from this core group of closet American communists. We have to stop Putin and it would be best to shut him down in the Ukraine before he can gain any momentum or make any more progress towards subverting Greece and Turkey. Russia has a relatively small economy and if China refuses to back Putin's madness, Russia will soon begin to crumble into pieces. We have to plant seeds in the minds of the elite of China, Turkey and Greece and be patient while these men and women study the issues we present to them. We do not have to win this fight in a moment, a minute or a year. The US Government and press should inform the Turks, Chinese and Greeks of the potential gain they will inherit from the balkanization of the Russian Empire which Putin heads. Turkey could dominate the traffic from the three great seas of the Black Sea, the Mediterranean and the Caspian, which is rich with untold stores of oil. China could as easily annex Eastern Russia as Russia invaded the Crimea. Greece could again become a shipping giant, greater than at any time in its glorious past. If Putin and Dugin keep piddling on America and Europe in their campaign to create a common hatred to form the basis for expanding their Soviet Empire, we will be forced to destroy Russia, and it will be very easy to do. All we need do is turn the Russian people against Putin by ruining the economy of Russia, and surround Russia with greedy neighbors ready to bite off their share of the pie. This is Putin's doing, not mine. He is creating the need to ruin Russia, not me. Putin has been waging war on my nation for years and will never relent. 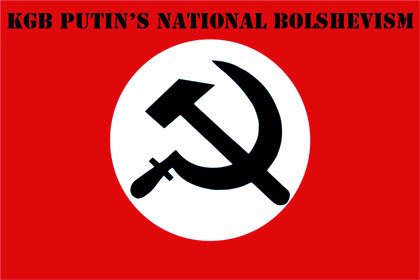 Putin has made it clear that it is Putin or the US and Europe in a life or death struggle between his jewish bolshevism and our love of the White Race and our lands. Putin will not last much longer. Everything is against him. He has made sure of that by creating a common hatred which is more rationally directed against him than anyone else. The Pentagon needs to go around the Mulatto House and insist that the US send food, weapons and combat advisors to the Ukraine. We should not leave the Ukrainians without a means of defense against the aggressive Russians. The old domino theory was correct. Communism is a disease that infects those around it. We have to stop Putin now. 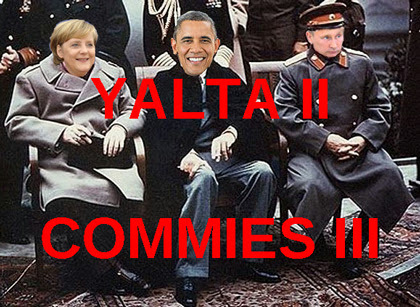 It is best to help the Ukrainians fight communism now, rather than fight it in commie Merkel's Germany tomorrow. NATO must prepare to use force. Weakness before communism is death. Libertarian communist Rand Paul is setting up to combat democrat communist Hillary Clinton, in their bid to instill more communist policy in the American Government, as they campaign against KGB Putin, while we sit by as bystanders to our orchestrated demise. Or, we can get busy organizing a Presidential campaign to defend America from the communists Putin, Paul and Clinton. If we want Western Civilization to survive, then we must defend it. The best means we have to defend the West is to place in power a patriotic American President who will fight for America's best interests. Our dissidents have been brainwashed to worship commie Putin and to look up to him to save the West by exterminating us. Open anti-Americanism cannot win a political campaign while the nation is under attack and the communists have brainwashed our dissidents to be openly anti-American and oppose a political solution to the subversion of America. Theirs is a recipe for American suicide. Those who can be saved need to be shaken awake and grow out of their contrived anti-Americanism to embrace a pro-American political movement to unseat the communist Pauls and Clintons. 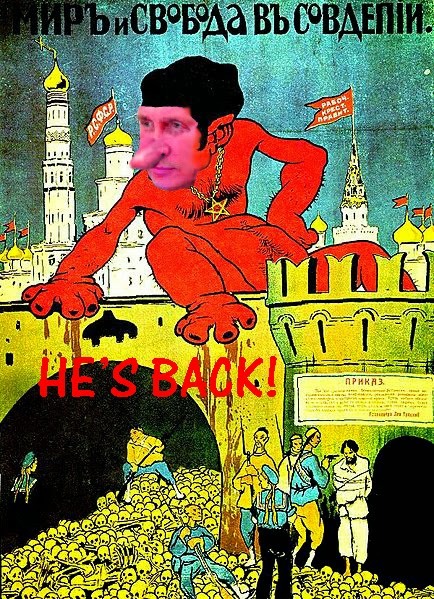 The communists will use their own puppet Putin to create an incentive for Americans to vote for a communist, just as they have used their puppet Putin to drive the Ukraine into the EU and debt slavery to the IMF. We need a voice to expose these crimes against us, a fresh untainted voice to speak up for America. We must do this soon because time is running out to launch a campaign for 2016.